By saying on Thursday night that he will push to legalize gay marriage, Attorney General Eliot Spitzer put himself at the vanguard of the effort to recognize such unions, staking out a position that most prominent Democrats, including Senator Hillary Rodham Clinton, have shied away from. 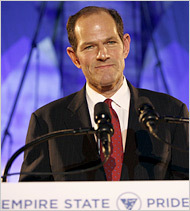 Eliot Spitzer’s promise to push for legalization of gay marriage was more than some in the audience expected. If elected, Mr. Spitzer, a Democrat, would be the most prominent state official in the nation to call for the legalization of gay marriage, though Democratic candidates for governor in California and Massachusetts have also expressed support. Many prominent Democrats, including Senator Clinton, have supported gays on other issues but not on this one, which has led to friction in their relations with gay leaders. Among the few prominent politicians who support it are Senators Russell D. Feingold of Wisconsin and Edward M. Kennedy of Massachusetts, both Democrats; and Lincoln Chafee, a Rhode Island Republican. The nationwide effort to legalize gay marriage has sputtered since a Massachusetts court legalized such unions in that state in 2004. In July this year, the New York State Court of Appeals said the issue should be decided by the State Legislature, giving the issue new immediacy in the state. Mr. Spitzer’s position could be a perilous one for a politician considered presidential material, and he has acknowledged that if elected governor, he would first push other legislative priorities including cutting property taxes and overhauling Medicaid . But last night he said he would not let outside pressures influence his stance. Even with a governor’s support, there is the not insubstantial matter of the State Legislature. Gay marriage bills have not advanced beyond committees in the Assembly, where Democrats have an overwhelming majority, and would face a difficult path in the Republican-controlled Senate. Mr. Spitzer’s Republican opponent, John Faso, does not support gay marriage. Shortly after Mr. Spitzer’s speech, Alan Van Capelle, the executive director of the Empire State Pride Agenda, said he did not expect action in the first year of a potential Spitzer administration. Mr. Van Capelle has not been known for his patience. In a video played shortly before Mr. Spitzer’s speech, Mr. Van Capelle criticized politicians who call themselves friends of the gay community but don’t follow through with reliable support, as pictures of Assembly Speaker Sheldon Silver and United States Senators Clinton and Charles Schumer flashed on the screen. He also expressed some optimism that the measure might succeed in the State Senate, which is controlled by a slim Republican majority. Joseph L. Bruno, the Republican Senate majority leader, has said he does not support gay marriage, but his stance on gay issues has moderated over time, giving Mr. Duane some hope. But his staff reiterated yesterday that he opposes gay marriage. The newly designated leader of the Senate Democrats, Malcolm Smith, made an unexpected appearance at the Pride Agenda’s event on Thursday and assured Mr. Duane that he was supportive of their cause. On Wednesday, he had been noncommittal on the issue. Mr. Silver has declined to take a position on gay marriage. Deborah Glick, a Democrat from Manhattan who is the Assembly’s only openly lesbian lawmaker, said that if Mr. Spitzer introduced a bill on his own, it would reshape the dynamics of the debate in Albany.